I spent a season on that little island, surrounded by ocean in every direction as far as the eye could see. I felt marooned in the most wonderful way. I was tucked into the sea. I woke up every day whenever I wanted to, made the strongest coffee my french press could hold, and ate fruit and bread for breakfast. I lost track of time. I had nowhere to go, except to this archway to sit and stare at it, and reflect on my life and how it was changing. 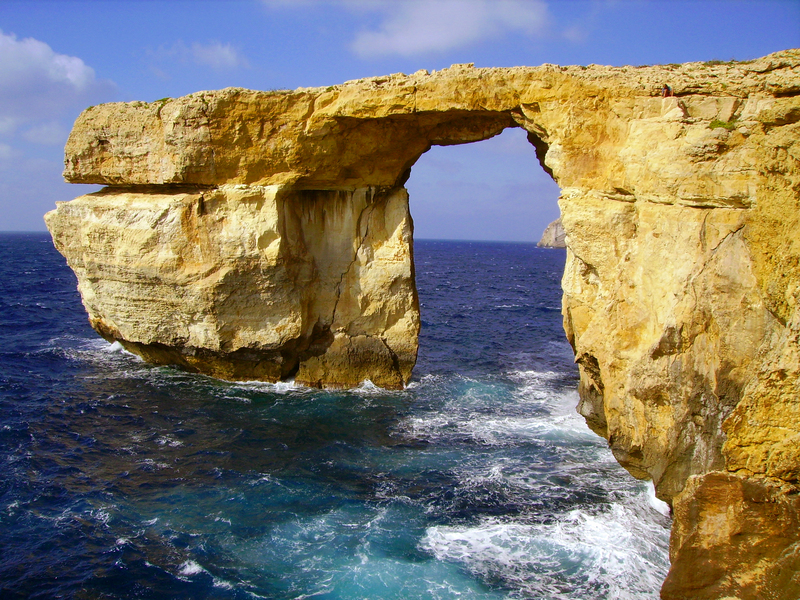 Once, when I was sitting near the arch with the salty wind in my hair, I remember hearing for the first time that it was known that the arch was unstable, and that it was only a matter of years before it would, eventually fall into the sea. My heart strained toward the arch, my grief immediate. My eyes watered just a bit, as I knew at the same time that when the arch fell it would be a reckoning…a sign. “And a great sign it will be,” I thought to myself, as Oracles do. I knew when it came, like a blood red eclipsing moon, it would foretell another time of great transformation, like the one I was having when I was there then. I felt the wave of all the feelings I would have when that day came…the day it crumbled. And then one day I felt that wave return, just a couple of months ago. Just as I had felt it in premonition back then. I would find myself standing in front of my computer one evening, finishing up for the day. I would see an email from my mother, and open it to find just a single line, a solitary link…no message. As I read the link, which contained the title words from an article, my hand would fly to my mouth and my eyes would fill instantly with tears. I had only seen the words “arch” and “fallen”, and it would be enough to let me know. I didn’t even open the link. The time had come. I felt, as I had so many times before in other lives when the sign came and my life was about to change. No matter how much I had known these signs and changes would come, they always seemed sudden…their portent like an ocean of its own growing in my heart and consuming what I had known, to make room for what was new. When I finally was able to look at the link, and the photos, I saw that the arch hadn’t just fallen…even its support pillar had been washed into the sea. It was like it had never even existed. When the ocean was ready she had just taken it in…she did her job so well. All the elements knew, even the tired stone, that it was time to let go. When I felt that this was my destiny, yet again too, I didn’t ask how to avoid crumbling. I asked for the strength to crumble with grace. Not the grace that looks polished and perfect. The grace that looks both perfect and messy…both flawless and wild. Because we are never done, so long as we are here and living the cycles…we are always bursting forth, blooming, and letting blossoms fall to make room for new ones. And the better we get at crumbling, the more it is one flow like the ocean’s waves. Sometimes it hurts, but even then we begin to realize this is only yet another liberation that awaits us. We are going to be more free when it is done. We realize that if something crumbles, there is no mistake. If it falls, it was not strong enough to build on, and needed to go down. We begin to trust that. Even if it feels as though we have lost the very bones we needed with which to stand, or walk. Even if it still aches beyond all comprehension as we watch it all fall down. And then, one day, when we can manage to look at what remains, as I finally did the day I saw the photo of the worn low nub of stone left behind where my arch once stood, we see something different. We see the place left behind that is strong…that withstands the passionate new sea that has been growing inside of you. You see the foundation for something new…smooth and shining under a new sun. You go there and feel that warm, new smooth stone beneath your bare feet. You feel that whatever comes from this new place will be yours. It won’t have been built by others before you, or what you have been told about who you are and what you can be. There, in the fresh crash of a wave and the new whip of bright wind, life will shine again. Life will shine again because you let go. You let go when everyone told you to hold on for dear life. You let go when your heart told you it was the only thing left to do. You let go even though there were no promises of bright new beginnings. You stared into the well of endings and said, “let it be so”. In that dark night, I commend you, fellow surrendering soul. I see a bright new time coming. I know you don’t think you are brave. The bravest often don’t. But you are brave beyond starshine and moonglow, and the darkness will show you the way through. Through even the archways that in this world have fallen, and to new worlds that we have yet to even know in our dreams. Here is to those new worlds, and here…with all my heart…is to crumbling. Also, if you love this writing, you will adore my courses, which you can see here, and my Orgasmic Woman Project here! Thank you for this reminder, on a day when I’ve been wondering how to come to terms with my own unending imperfections, with feeling a longing to do something that my nature considers good enough. I know people say to embrace your imperfection, but your writing offers me an alternative: it says, sometimes what feels so agonisingly imperfect is something that needs to crumble. That rather than hold onto it and be continually frustrated, we let it finish falling down. My body feels like it’s crumbling, like it’s been doing that for years now, and perhaps rather than continue to invest huge amounts of time worrying and fighting that, I can accept its crumbling with grace, considering the idea that this may need to happen to make the room for something new to emerge. Hope that makes sense. All the best to you and the other readers here. Hi Rachel! Such a truly beautiful sharing..it warmed my heart so much!! Yes, it makes more sense than I can say. : ) Sending love and big hugs!! Hi Gwendydd! Oh, I love it! Yes!! And bring on the Pheonix for sure! I love it! Sending love! Jennifer, thank you! Thank you for the reminder to allow things crumble. I felt like the knob of the arch, and I felt like a total failure. I was trying so hard to stop the crumble, to make it work – and today I decided to let it all fall. I was so exhausted from trying – I was considering ending it all. Thank you. I feel I can breathe now. Not yet with a full breath, but it’s a start. Oh beautiful Oksana, thank you so much for sharing! Brings tears to my eyes!! Sending love and huge hugs! Thank you so much for this beautiful writing! It resonates so much with what I am currently experiencing and developing into. There is so much beauty in change and all those other things I used to be afraid of. Your text gave me another loving encouragement <3 thank you so much!